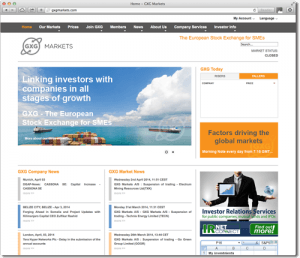 Create a single, multilingual website for financial market "GXG Markets" to replace their existing independent Danish and UK based websites. The GXG market website was a large undertaking that was developed in phases over a number of weeks. Aside from the usual work required to develop a large website of standard pages, the main requirements here were that the website needed to be able to display a series of disparate real-time news and market data feeds in a variety of views, and also that the site needed to be built from the ground up with the ability to support 2 languages and the possibility of more in the future. We considered a variety of popular CMS packages to use as the framework for this site, but eventually decided that our go-to CMS (Joomla) would be the best option here. We wrote a series of bespoke Joomla components and modules to import and display the various news and market feeds that we were being supplied with. These included feed parsers to ingest real-time market data and news feeds supplied by GXG themselves, and also by Thomson Reuters. This required us to liaise with their respective technical teams to ensure we were collating the correct data from each feed and were using their approved methods of retrieving their feeds. When we import the feed, we then add this to a database to cache the results so that we're not constantly hitting the feeds, and that if the feeds are not available at any given time, this does not affect the website (a problem they had with the existing site). Setting up a multilingual site in Joomla was fairly simple. We just made sure that there was no text hardcoded into the page templates. Instead, we used placeholders that could then be replaced with text in whatever language was required within the Joomla back-end interface. Equally, in the back end, we just needed to make sure everything was set to a specific language so that the front end knows what it should be showing at any given time. The rest of the site, while large, was mostly bread and butter stuff for us! Image sliders, all content user editable, multi-level navigation, sortable and searchable tables of data - all present and correct! 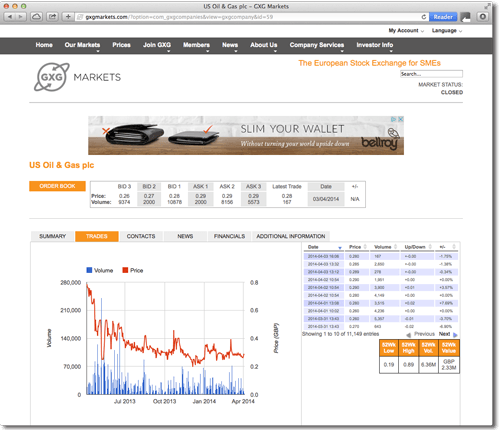 Note - GXG Markets has now closed, so the website is no longer accessible.